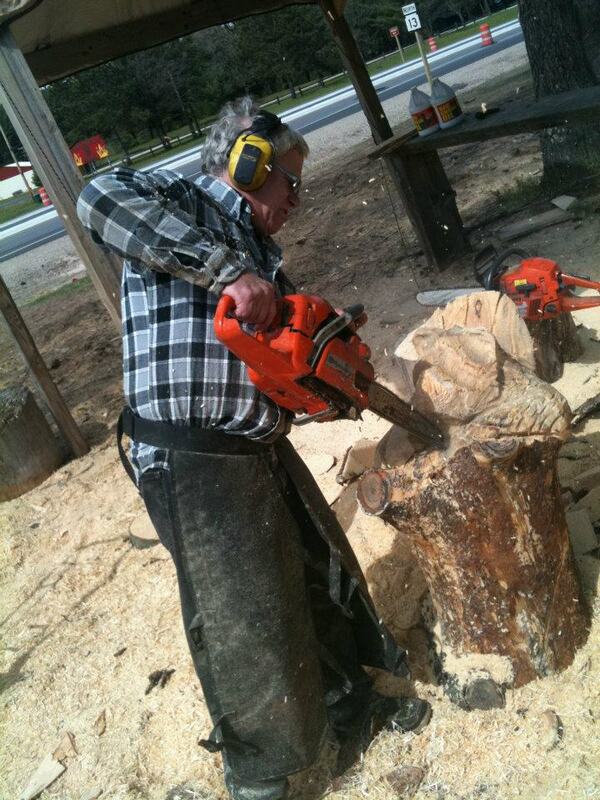 Usually, using power tools is something I try to avoid whenever possible, but during my latest Dells Bucket List adventure not only did I find myself wielding a chainsaw, I realized that it can be rather fun as well. The reason for my rare foray using such a potentially dangerous apparatus came during a recent morning when I attempted to learn how to sculpt a log into the form of a bear, courtesy of a local U.S. Grand National Champion carver. For more than two decades Dave Watson has been carving wood sculptures with a chainsaw on his forty acre property in Wisconsin Dells. Most notable for his whimsical bears, Dave uses his creative talents to transform plain wooden stumps into a variety of beautiful works of art. Originally from Wisconsin Rapids, Dave began his sculpting career not in wood, but with chocolate, butter, cheese, and ice. After attending Madison Area Technical College for cooking, he traveled as a chef for nearly fifteen years with stops in Denver, Europe, and eventually ending up in St. Paul, Minnesota, where he discovered the art of sculpting wood after years of competing in ice carving competitions. 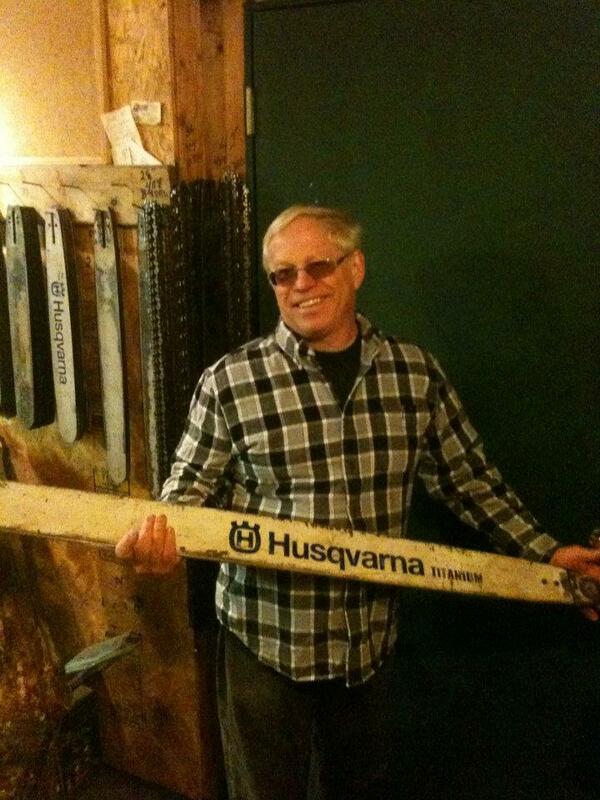 Looking for land in the Dells due to it being a tourist destination, he and his wife Annette found what they now call Watson Woods in May of 1990, and opened a showroom that sells a variety of unique rustic items in 2000. After showing me his extensive chainsaw collection, we made our way to where he does his initial carving, near a log cabin called Great Bear Lodge. I immediately noticed a vast amount of sawdust everywhere. Dave says that he produces at least sixty gallons of sawdust a day, and while he had only just begun carving for the season, the ground where he works was covered in several inches of it. 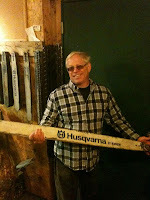 Dave prefers to carve white pine that he gets from locals, or from loggers who he buys from by the semi load. Once he sculpts the logs into a general shape with a chainsaw, they are burned, wire-wheeled, grinded to smooth and highlight, then painted and coated with a varnish for protection from the elements. 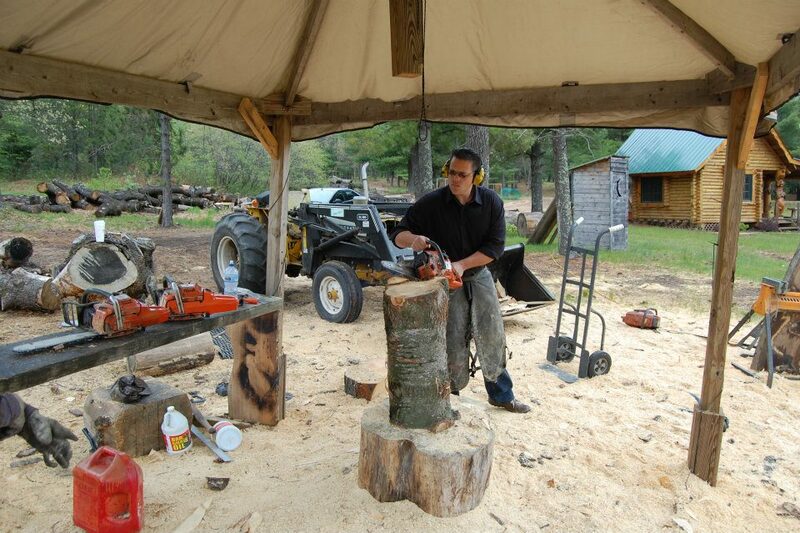 Depending on the size, Dave carves anywhere from two to eight sculptures a day. 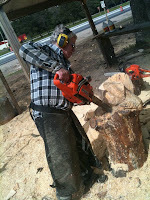 Wanting to see some carving in action, I stood back as he started up a chainsaw, and watched in amazement as he launched masterfully into cutting the stump in front of him. Sawdust was flying through the air, and very quickly the shape of a bear’s head started to form. As he deliberately removed chunks of wood, one forcefully flew by me as it shot off from the saw. Mentioning this to Dave, he told me that’s why it’s necessary to wear goggles, as well as have netting around him when spectators watch him carve in the summer. Getting a firsthand look at how dangerous this occupation can be, I asked if he’s ever been injured before. “Yeah, I’ve been stupid a few times!” He laughed, recounting the time he got over thirty stitches in two of his fingers when his hand slipped & slapped the saw. This gruesome image is what was racing through my head when it came time for my turn to give it go. After putting on a pair of chaps, goggles, and headphones to help drown out the noise, I took the powerful gas chainsaw that Dave handed me, and started cutting. While Dave makes things look relatively simple, I found it definitely wasn’t as easy as it seems. Trying to keep the heavy chainsaw steady enough to make the precision cuts needed for a bear’s facial features was tough, as my sore forearms could later attest, and only after Dave cleaned things up a bit did my handiwork remotely resemble a bear. *** I'd like to say thanks to Dave and Annette for inviting me into their home, showing me around their property, as well letting me wield a chainsaw. I also would like to thank Jason Oksanen for taking some of the pics. For more pictures, please visit the Dells Bucket List Facebook page here .